Monterey’s 17-mile drive is one of the most famous and scenic roads in the world. We at oM, of course, believe it’s far better traversed on two wheels than four. Not only can you skip the entrance fee, but experiencing the ride sans-moto adds extra drama to the crashing waves, rugged coastline and over-the-top mansions. Here’s what you need to know. The Lone Cyprus: One of California’s best-known landmarks, the Lone Cypress has managed to survive on its rocky perch for over 250 years, and makes for a beautiful photograph. The Lodge at Pebble Beach: The Lodge at Pebble Beach was built in 1919. heart of tony Pebble Beach Golf Links and Resort, it’s a great place to hobnob over a drink or a light bite. Read about more things to do in Pebble Beach. Take Caltrain to the San Jose Caltrain Station. From there, walk to Cahill/Diridon Station and take Bus 79 towards Monterey. (Note that it could take about three hours to reach the area by public transportation. 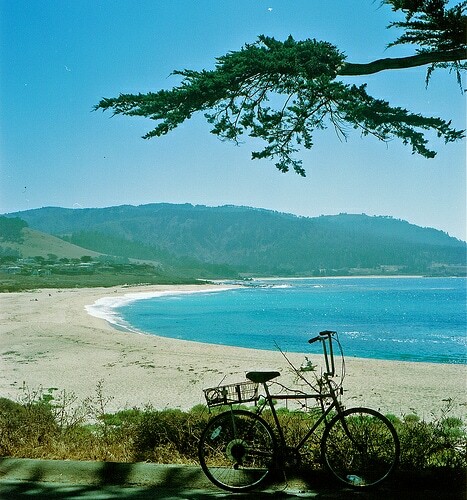 You can also drive to Cannery Row and rent your bike there.